My rating: 8.5/10. Very good watch. It really is massive. Today I’m doing a Fossil JR1353 review. 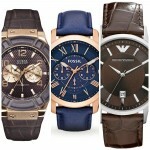 Fossil are one of my most recommended affordable watch brands. They create high-quality timepieces and offer exceptional after sales customer service. 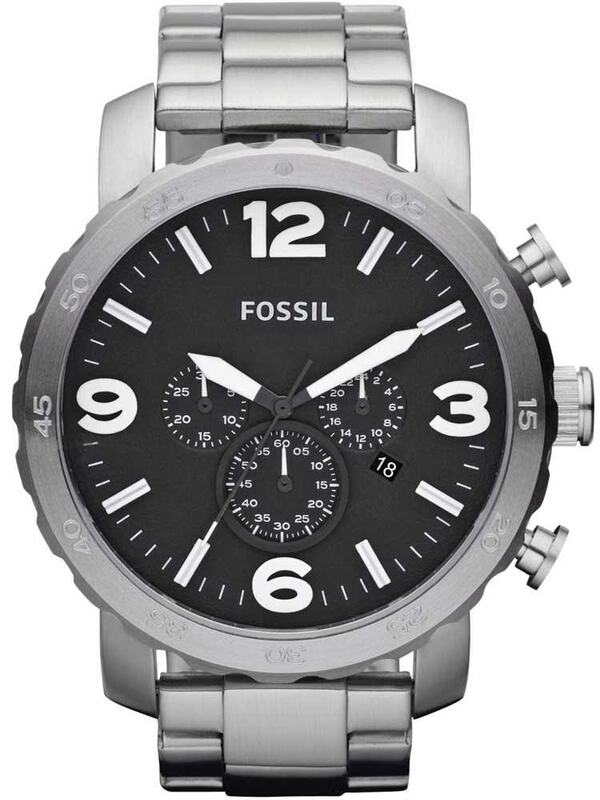 The Fossil that I’m reviewing today is military inspired as has a massive oversized design to it. If you love large oversized watches you’ll be happy to hear this has a casing diameter of 50mm. That’s definitely going to be visible on your wrist and get your watch noticed. With its large design and high-quality finish, the JR1353 offers some pretty good value for money in this price range. If you are interested in buying this watch then at the bottom of this page I have links to my where it is available at my recommended retailers. It’s worth checking between them for the best price. Firstly let’s take a look at some of the Fossil JR1353 technical specifications. If you’re more a fan of skim reading then this will suit you. Fossil has gone big with this watch, very big. A 50mm case is really pushing the boundary for oversized watches. Whilst this is great for some people I really can’t see this being so suitable for those with smaller wrists. 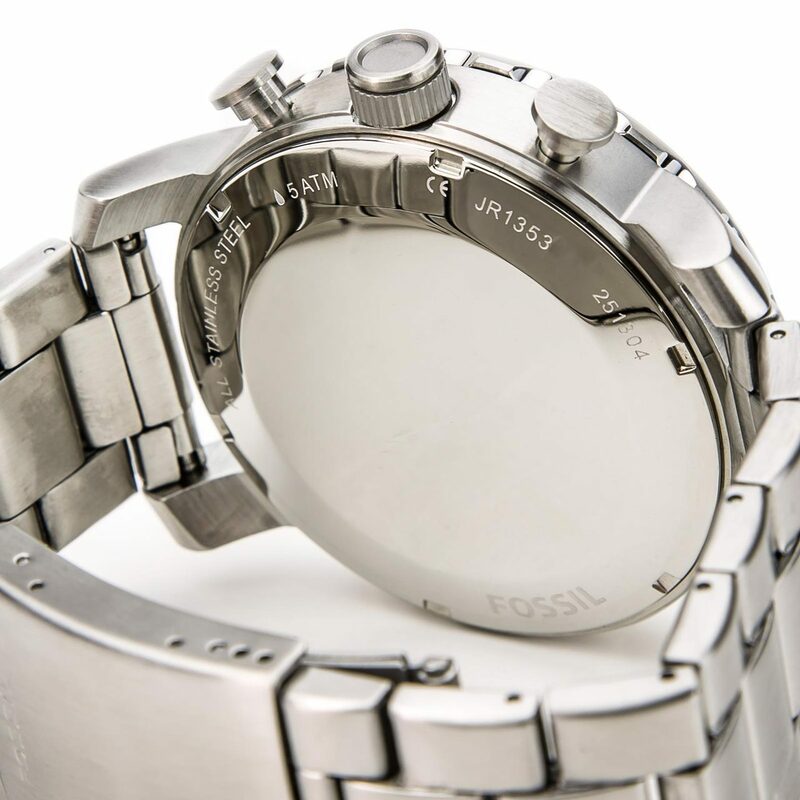 The watch is made of stainless steel with a nice brushed finish. I particularly like the crowned effect on the bezel, adds something a little different to the watch design. 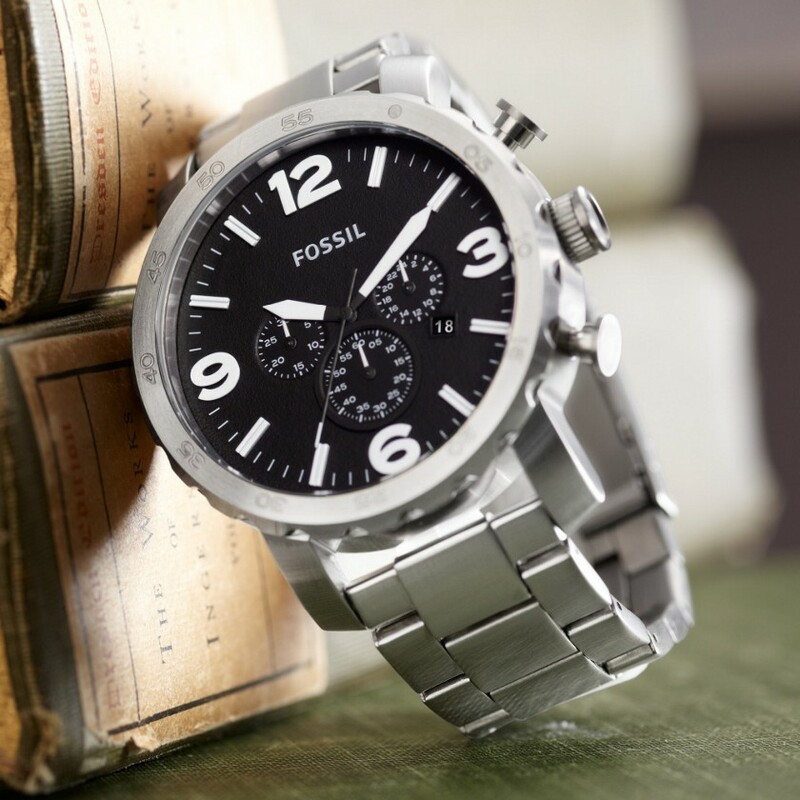 As with all Fossil watches, the JR1353 has a high-quality finish they should be proud of. The dial of the watch is exceptionally easy to read. With its large display and ultra bright high-visibility hour markers and hands, it’s easy to tell the time with just a glance. The numbers are in an Arabic design with just the 3/6/9/12 showing. There’s a chronograph movement which adds the date and 24 hour mode to the watch dial. It’s huge, okay I’m sure I’ve mentioned it enough now. With a 50mm casing diameter, this watch is one of the largest you’ll see available only. The thickness of the case is fairly modest, though, at 13mm. With a 13mm thickness, you avoid that extra chunky look that some love, and some hate. As for the sizing of the strap, it has a width of 24mm. this Fossil watch features a fairly standard mineral glass. Mineral glass is hardened especially to be extra resistant to scratches and knocks. At this price range, mineral glass is exactly what I would expect to find, so this watch offers fair value for money in this department. The strap is made of solid stainless steel and features a single-sided push button release, fold over clasp. With a wide of 24mm it sits nicely and is suited for a larger case diameter. Now some would argue that the JR1353 lets itself down a bit in this department. For a watch with military inspiration, you might expect something better than 50m water resistance. But if you take into account the price then I’d say we’re not doing too badly. 50m water resistance is suitable for swimming, white water rafting, non-snorkeling water related work, and fishing. This Fossil JR1353 features a Japanese Quartz movement. Quartz movements are fairly common due to their affordable price and great accuracy. The work by synchronizing a quartz crystal with an electronic oscillator. The electric current then causes the quartz to pulsate at a precise frequency which gives you this great accuracy for a modest price. Next up let’s take a look at some of this extra large fossil watch’s pros and cons in an easy to read skimmable format. 50m water resistance is suitable for swimming, white water rafting, non-snorkeling water related work, and fishing. Mineral glass offers a good level of protection from scratches and is what I would expect to find at this price range. 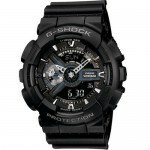 With such an oversized design at 50mm this watch may not suit those with smaller wrists. So that completes my detailed Fossil JR1353 review. If you love watches for their sheer size then I’m sure you’re already wanting to add this to your basket it and get it onto your wrist. But even if we ignore the size for a minute, this is a very well built watch with a great display that’s perfect for those who struggle to read normal watches. If you’re after a high-quality chronograph timepiece I suggest giving this some consideration. Overall I’m liking this watch a lot. I also trust Fossil as a brand having dealt with their customer service team before for an old watch they were extremely helpful to me. 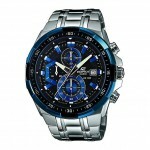 At this price the watch is a steal, in my opinion, great value for money. Taking into account the build quality, materials, design, and pricing we decided to award this watch an 8.5/10 from us at The Watch Blog. This model is available from a few places online. Personally, I always stick to recommending retailers I’ve actually purchased from. Below you’ll find a link to the sales page for this watch on each of my recommended retailers websites. I’d suggest checking out all 3 to find the best value for money available to you. I hope you enjoyed having a read through of this extensive Fossil JR1353 review. As always let us know in the comments section what you thought.